Minister of State for Housing and Planning Brandon Lewis has seen first-hand the progress being made on the Kettering East development. During his visit, the minister saw how the development of new primary school Hayfield Cross, which is on schedule to open in September 2015, is progressing. The new primary school will be the first major project on the development to be completed. During the minister’s visit, he met leaders and chief executives of local councils in the north of the county. Developer Mark Best said: “It is really exciting to see the first phase of development commence at East Kettering. “The school currently under construction is a great example of the infrastructure-led development that is being delivered in Kettering and the wider north Northamptonshire growth region. Council leader Russell Roberts said: “We are very grateful of the continued support from the Minister of Housing and Planning, Brandon Lewis, in helping us deliver managed growth locally. 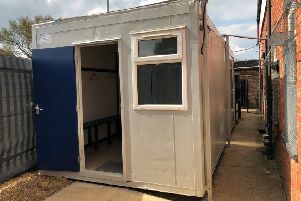 “Today we have witnessed first-hand the excellent progress that is being made on the construction of the new primary school at East Kettering, which is an example of how this support is helping.